. Note that Hewitt, Dimkins and Pilkington are also in the department alongside Bristow and Jones. The department is headed by the Chief Buyer, Mr. RJ Fudge. In earlier days, as we can see from the example above, Hewitt and Pilkington worked alongside Jones and Bristow. (Dimkins was never actually in the Buying Department but worked next door in Invoicing). Indeed, the Department was positively crowded during the 1960s. Pilkington was a sort of senior clerk, paid a little more than Jones, Hewitt or Bristow, though seated with them at a desk in the main office. Then a youngster from the Northern Branch, one Barker, joins the Department and is soon promoted above the other clerks to the position of Assistant Buyer. Pilkington, foot half on the management ladder, is complacent but Bristow, Jones and Hewitt are furious. Apart from plotting, they fail to do anything about it, of course. The moment that the boss is out, work is put away,animosities are suppressed and everyone joins in the fun. If they need a fourth for bridge, Dimkins will be cajoled the moment he makes the mistake of entering the department. 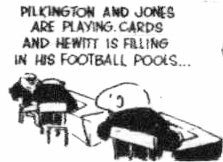 Barker left the strip in 1965 and gradually first Pilkington, then Hewitt faded out. No deputy has been appointed. Indeed when Fudge is on holiday the temporary Chief is chosen by the time-honoured C-P method of first clerk to raise his hand. Or someone like Softy Palmer draws the short straw. , a strip that perfectly encapsulates Bristow's relationship with his boss and typifies the plight of middle management and staff, both trapped in roles that they cannot escape. The clerk's room is fitted out with the usual filing cabinets and battered old desks, a hatstand and a jealously guarded window. And a radiator or two. Having a desk either by the window or by the radiator is a matter of great consequence. Bristow is keen on his access to the window, especially when his friend the pigeon is fluttering by, or there is a chance that Miss Pretty of Kleenaphone may drive by (although in the latter case he will be quickly elbowed aside by every clerk on the floor). shows, it was being redecorated. The previous colours, olive green walls, sludge brown doors and black surrounds are being excitingly updated. The department that held at least 6 staff in the beginning had shrunk to two clerks and a Chief Buyer in the late 1970s, a size it thereafter retained. But therein lies a great mystery. For Bristow is, as he has always maintained, no less than 18th in line for the position of Chief Buyer. Surely there should be 17 additional clerks in the department? Or if not actually there, then working in similar positions in the C-P organisation (we learn of one or two counterparts in the Northern Branch in a recent strip on Frank Dickens’ website)? It is hard to think who might be in line for a Chief Buyer’s job other than people in that line of work, but there is precious little evidence of them inside the walls of the Chester-Perry building. That Bristow is 18th is well known to everyone in the Chester-Perry organisation. In strip 1918 Miss Sunman and Miss Rouge list the 17 men ahead of him whilst lunching in the park. The full list is Pope, Holland, Edwards, Cole, Lamb, White, Buxton, Balchin, Breeze, Mylett, Cook, Hacker, Jenkins, Ingram, White, Perrins and Scarfe. None of these have ever been known to have served in the Buying Department but one or two names are familiar. There is a reference to a Mrs Mylett, implicated in the Great Tea Trolley Disaster. Messrs Pope, Hacker and Balchin are managers in Personnel at various times. And I rather think that Messrs (Hector) Breeze, (Peter) Cook,(Richard) Ingram(s) and (Gerald) Scarfe, at least, may be not unconnected with Private Eye magazine. But not with the world of Chester-Perry. So Pilkington, Hewitt and even Barker do not feature on either the typists' list or on Bristow’s list. And neither does one other name – Jones. It is not at all clear if Jones is superior to Bristow. Bristow claims to have seniority over Jones because he has worked longer for C-Ps (and because he is higher up, alphabetically). He goes so far as to claim that he, Bristow is 17th in line and that Jones is 19th. The missing slot is awarded to the pigeon that wastes so much of its time lolling around on Bristow’s window ledge. Bristow is probably wrong. People are always being shown round the offices and Bristow is invariably pointed out (whilst fast asleep or idling away the time) as the man 18th in line for Chief Buyer. Who’s Who at Chester Perry’s has him as 18th in line. And there, despite eight and two thirds years service, he seems destined to stay. In any case this is all academic. When Fudge is, for a brief period, promoted outside the department his place is taken by an outsider. Nobody on the list, or indeed anyone that Bristow has ever heard of, is considered for the job. It would make no difference if Bristow was 1st in line for Chief Buyer. He still wouldn’t actually get the job. In strip 583 (this number was also used in December 1962), January 1963, Bristow gets into the office to measure the working space allotted to each clerk and is depressed to find that Pilkington has 25 square feet, Jones and Hewitt 9 square feet each whilst he only has a rather unlikely 5 ½. Strip 2610 was published in the Evening Standard in July 1969 and in Bristow (1970). Where is the Buying Department? In 1973 the department is on the third floor (source: strip 3850) but in 1978 the much-travelled two men who are always roaming around find Bristow kicking a can of clerkomeat along the second floor (source: strip 5064). 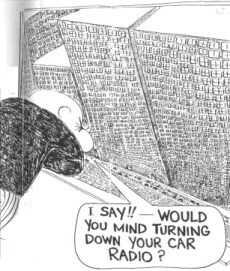 In November 1981 Bristow wastes time exploring the fourth floor and claims to be directly above his own office (strip 6021) so buying has moved back to the third but In 1999 it is definitely on the second (source: strip 10390). It was still there in 2000 (source: strip 10829) when Bristow congratulates Hickford on having got as far as the second floor as he distributes the bumper autumn number of the House Journal. It seems fair to conclude that the department has settled down there. Good news for Bristow for those days he needs to race up the stairs to beat Fudge into work.